In continuing on my mission of discovering all aspects of business communications, I have decided to take a more “internal” approach this post. Within the HR or internal strategic management side of communications, there is a wealth of knowledge to delve into, but not enough room in the post. Therefore, I am going to touch on an aspect, presented in this lovely infographic, which is not talked about often. In this graphic the website “GlobalThinking HR Communications” presents information about the declining employee-employer relationship that is currently plaguing small and big business alike. Not only do they say that employees are no longer loyal to their respective employers, but that employees are also losing their confidence in their employers. While, some business owners may have differing opinions on loyalty, I personally feel it is one of the most important components needed to conduct business. According to this graphic, employee benefits are correlated to employee loyalty. More importantly, employees want to have great benefits that are clearly communicated to them. When I reflect on my own personal career goals, I too also feel great benefits are a sign of success in ones “career journey”. We all aim for them, but how many of us really get those “idealized”, great benefits we all dream about? 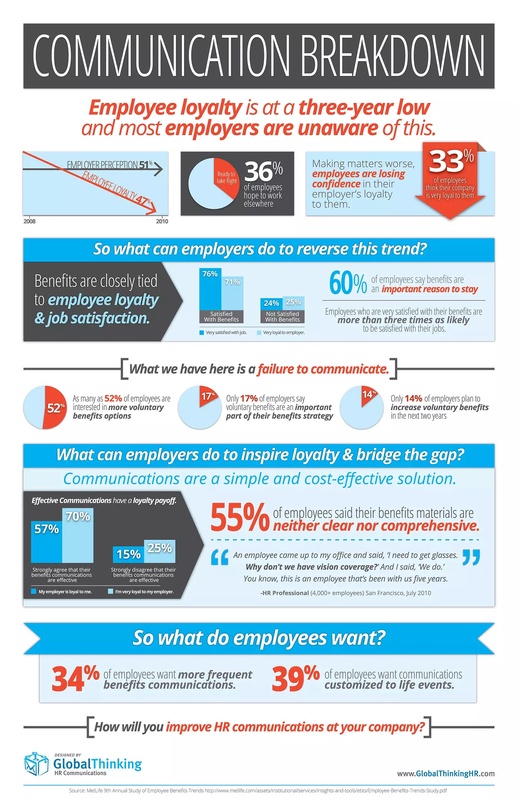 Overall, after analyzing and reflecting on this infographic, I realized I’m “one of those” employees that see the correlation in workplace benefits and loyalty. Not only does it assert the employers credibility, but also shows how loyal they are to their employees. This I cannot disagree with. I recently came across this really cool infographic, which breaks down the basic tools needed to build your brand. The first segment of the infographic focus on “why?” you should build your brand. It gives reasons such as customer loyalty, as well as building awareness and brand reputation. This helps to create potential revenue, which is reliant on the fact that you have a strong consumer base, who keeps coming back. The next segment talks about getting to know your audience. Through techniques and strategies such as listening to your consumer base you can gain a better understanding of their demographics and online habits. Things such as: age, gender, household income, amount of time spent online, and keywords people use to search your product, is information anyone building a brand should have readily available. The third segment of the inforgraphic discusses tailoring your brand to your audience. This is achieved through constant interaction with consumers on your company’s social media platforms, answering questions and advertising. Costumers need to be able to readily and easily recall your brand and a great online presence can aid in this. Finding out the customers’ likes or dislikes as well as asking questions like: what problem can you solve for your customer? How can you solve their needs better than anyone else? are essential to providing excellent branding online. Lastly, the last segment of the graphic focuses on “being the brand”. A great website with a good domain name is needed to not only attract and keep your customers engaged, but also allow for easy searching online. Keeping active on the various social media platforms and staying up-to-date is essential. Creating conversation and allowing for feedback, creates an open environment where customers feel connected to the company. Your social media username and website URL should be short and easy to remember. Magazine or newspaper articles are also good methods for quick exposure. Overall, the majority of people rely heavily on the internet for the consumer needs, whether it is online shopping, browsing, or researching new products. Therefore, great online branding is an essential in this competitive online market, and knowing and interacting with your customer base is a must in order to stay on top. On my continued exploration of “the business side of communications” I’ve decided to dive more into the concept of “branding”. At first thought it sounds intimidating, like something which would involve big leaps of faith and unprecedented risks, with little in the way of “hope” to fall back on. While, branding is often tricky and can be hit or miss, a website call betterbusinessbrand.com, has broken down this concept in a creative, yet tangible way. 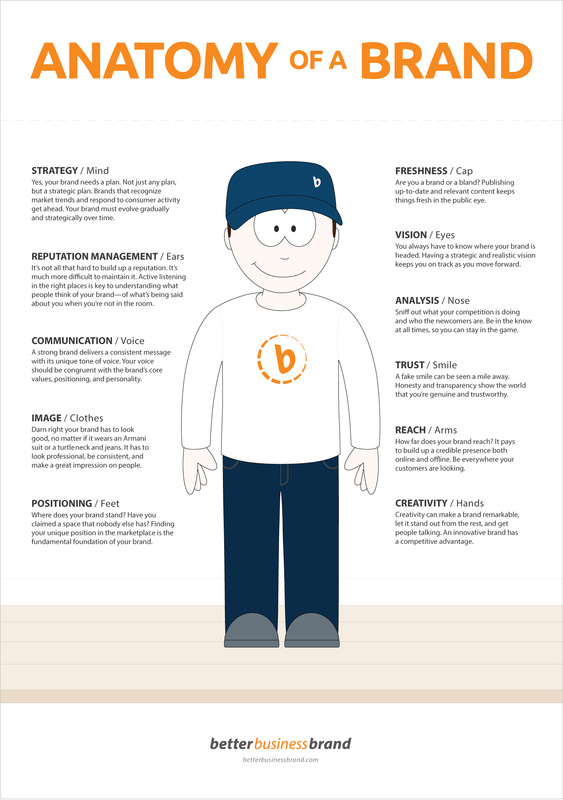 In their infogrpahic, “Anatomy of a brand”, they have associated various physical traits with their corresponding “business minded” characteristics. All, the way from your clothes, feet positioning, ears and mind, they have got you covered. Even the most skilled entrepreneur or business minded individual can benefit from these simple yet effective tips in personal branding. In an era where new and social media are so rampant and instrumental in the branding of business and people alike, you would have thought we would have all mastered branding by now. However, even the most skilled business minded individual requires the basics to operate. Thus, betterbusinessbrand has taken the work load off our shoulders, by doing the homework, and now all that is left is for us to study, learn and master these basic, but necessary concepts. READY, SET, BRAND!